The Number "ONE" Window Lock Fitting Service by North London Locksmiths Ltd. The Number "ONE" London Locksmiths and Carpenters for the fitting of all types of locks, including window restrictors. Call our office on 020 8800 6041 to speak a member of our Locksmith Team for advice or an estimate. North London Locksmiths Ltd. offer the Number "ONE" Window Lock Fitting Service, covering North London and North West London. Our Master Locksmiths and Carpenters have fitted many many thousands of Window Locks, over the 30 plus years we have been established. WARNING!!! Did you know, that somewhere in your Insurance Policy, it will state that you must have Window Locks fitted to all accessible windows, as well as a British Standard lock fitted to your final entrance door? Well! Here at North London Locksmiths Ltd. we supply and fit all types and makes of Window Locks, whether to wooden, metal or UPVC windows, as well as Fitting Locks and upgrading locks to cover your Insurance requirements, as well as a full Lock Change Service. WE COVER ALL OF THE FOLLOWING AREAS PLUS NORTH WEST LONDON AND MORE. Call us on 020 8800 6041 for Window Lock Fitting Service and Window Restrictor Fittings. Our London Locksmiths, as well as offering a first class full opening and lock changing service, also fit Window Locks of every description, including to UPVC Windows. Our Carpenters like our fully qualified Locksmiths, also fit window locks to all types of windows, they will also repair door frames as well as fitting doors, to replace damaged ones or to enhance your property. North London Locksmiths Ltd. are an established, registered Company, being based at the same Locksmith Shop premises at 79 Grand Parade, Green Lanes, N4 1DX. for more than 30 years and are proud Company Members of The Master Locksmith Association. All this adds up to a very important issue, when fitting or replacing locks at your home. REMEMBER! When moving into a new home always replace at least one lock. Our Carpenters will come out to repair frames, on a temporary basis, under our 24 HOUR Service, in the event of an emergency break in etc. We offer a fast reliable 24 HOUR Service, in the event of an emergency, where you may need Locksmiths to open a door, because keys have been left inside your home, or you have a faulty lock. Our average response time is between 20 to 40 minutes, from the time of calling our office. If we cannot make it in this time, we will let you know first. DO YOU HAVE YOUNG CHILDREN, OR NEED VENTILATION DURING THOSE HOT SUMMER NIGHTS, WE SOMETIMES GET? LOOK AT OUR WINDOW LOCK RESTRICTORS, FOR SECURITY AND VENTILATION. TELEPHONE 0208 800 6041 ANYTIME DAY OR NIGHT. At our Locksmith Shop we stock a large range of Window Locks, whether to wooden, metal or UPVC. MAYBE YOU WOULD LIKE TO BUY WINDOW LOCKS AT DISCOUNTED PRICES, THROUGH OUR WEB SHOP, PLEASE FOLLOW THIS LINK TO OUR WEB SHOP WINDOW LOCK SALES. At our Locksmith shop base in North London, very local to all areas of North London and North West London, at Green Lanes, Haringey, we sell all makes of locks as well as making keys to locks where keys have gone missing; we make them to copies as well as doing our own special section units, which can only be copied on a signed request. We master and pass locks, as well as repairing them; we make keys to ignitions, where they have been lost, plus programming keys to your transponders. Our shop team will give any help required on Locksmith work, whether you want keys cuts to locks or car ignitions. North London Locksmiths Ltd. sell all leading makes of locks, including well known and not so well brands. Please telephone 0208 800 6041 if you would like some help on a lock or key problem, our friendly staff will be happy to help you. 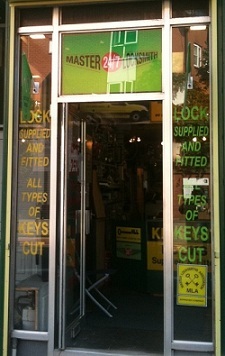 WHY NOT TRY OUR LOCKSMITH SHOP FOR KEY CUTTING AND THE REPAIR OF LOCKS, AS WELL AS BUYING THEM? If you would like an estimate on any HOME SECURITY work in which we undertake including our Window Lock Fitting Service as well as any other security work we undertake, including our Lock Fitting......Lock Changing......Lock Opening......Door Fitting.....UPVC Lock Services, please fill in the estimate form below and submit to our office, we will repond with an estimate as soon as possible. If you wish, you can contact our office on 0208 800 6041 for any advice, from a member of our Locksmiths team, you may need on keys or locks, or for a verbal estimate. WE ACCEPT BOTH DEBIT AND CREDIT CARDS, ON SITE, DAY AND NIGHT.